John and I have been on two cruises. It was not the kind of vacation we thought we would like. But we ended up liking our first 7-day cruise in 2009 so much that four years later we went on one for 14 days. The trick for us was finding the right ship. It was so, so, relaxing. I think I read 12 books in 14 days. So flash forward five years to a different kind of experience at sea. Friends of ours bought a residence on what is billed as the world’s largest private residential ship. What does that mean? Well, it isn’t a cruise ship and it doesn’t mean time shares. It means people actually own a residence on a ship, much like a condominium. They own their unit and a share in the ship. 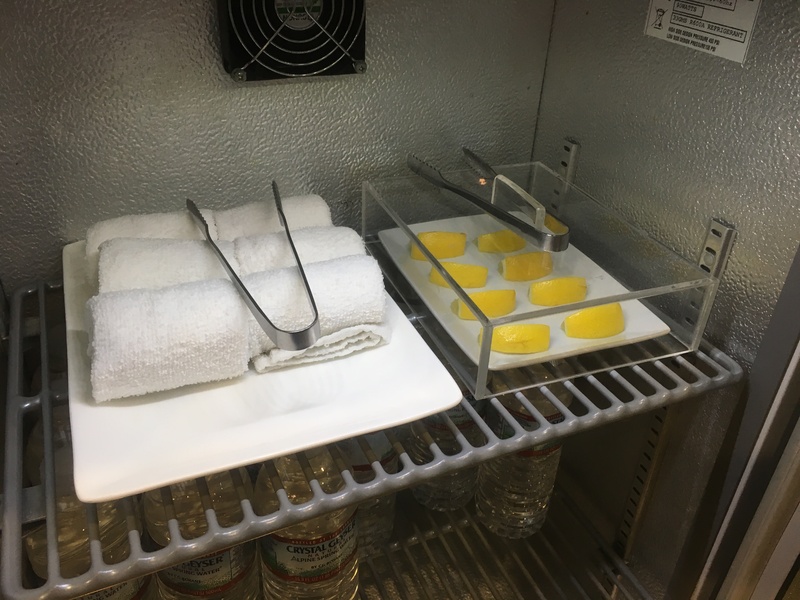 Some of those units (like the one we were in) are studios and look much like a cruise line cabin, but others have two and three bedrooms and have kitchens just like a place you might live. The size of the ship is about 644 feet which is about half the size of the Celebrity ship we were on. The Celebrity ship hosts about 2,800 passengers, this one only had about 250 aboard while we were on it. It felt gloriously un-crowded to us, but apparently 250 is a higher than usual number of passengers. So where does the ship go? Well, that is perhaps one of the most romantic parts of it for me. 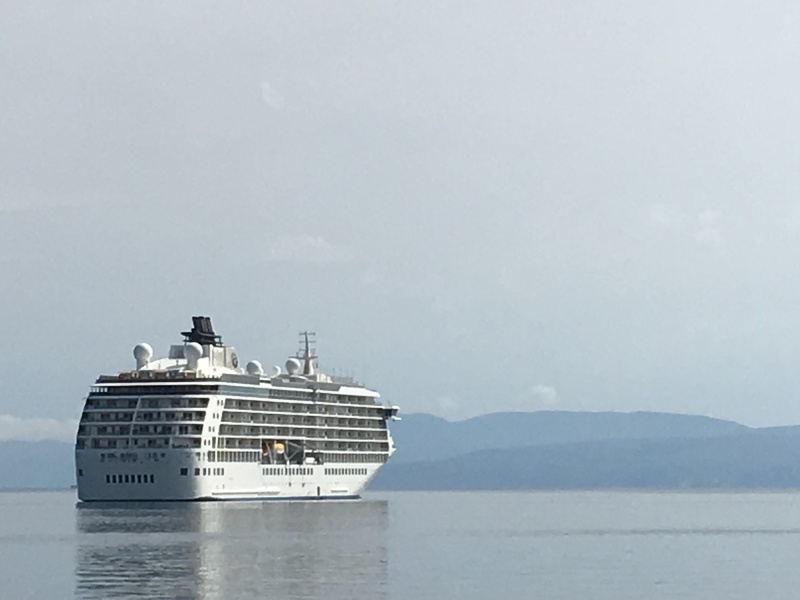 I often pore over cruise line catalogs for so-called “world voyages” where a cruise line literally goes around the globe in about 90 to 120 days or so. I don’t think I would actually like to do that, for one thing I’m not sure I have the sea legs for it, but I love the idea of it. Imagine being free of work and being able to spend 120 days seeing the world and never having to change hotel rooms. It sets my pre-airplane nostalgia meter to high. Well this private ship is a bit like that except it takes the whole year to go around the world. And because it doesn’t have to follow the parameters of the cruise industry that needs to keep their ships full of revenue-producing passengers, it can go as slow as it wants to. It goes to out of the way places like St. Helena, Napoleon’s final island of exile smack dab in the south Atlantic. Instead of one day in a port, the ship almost always spends the night and more often spends 2-5 nights in a given port. There are also parts of the itinerary that say things like “Captain’s Choice” with no set itinerary other than the general location of where the ship will be at the time. Another aspect of this ship that I totally loved is that, although it has some great restaurants on board, unlike a cruise ship, the food is not included, you pay for it as you use it. This means that when you are in a port of call with fabulous food onshore, there is no incentive to run back to the ship to eat your meals. And when you are in the Mediterranean there is a lot of food on land to tempt one. What about the residents? Our friends who own a unit were not on board while we were so we weren’t sure what to expect. We kind of expected the residents not to want to mingle with temporary guests like ourselves. Well, not only did we meet other temporary guests who were friendly, the residents we came across were extremely friendly and went out of their way to introduce themselves. While one would certainly need to command a certain amount of wealth to own a residence, the owners we met were not even remotely flashy and were, dare I say, down to earth. Some spend a few months a year on the ship, others spend most of their year aboard. I think if there was one common thread among the people we met it was that they were all rather intellectually curious and had a sense of adventure. In the days to come I will show you all the places we went. 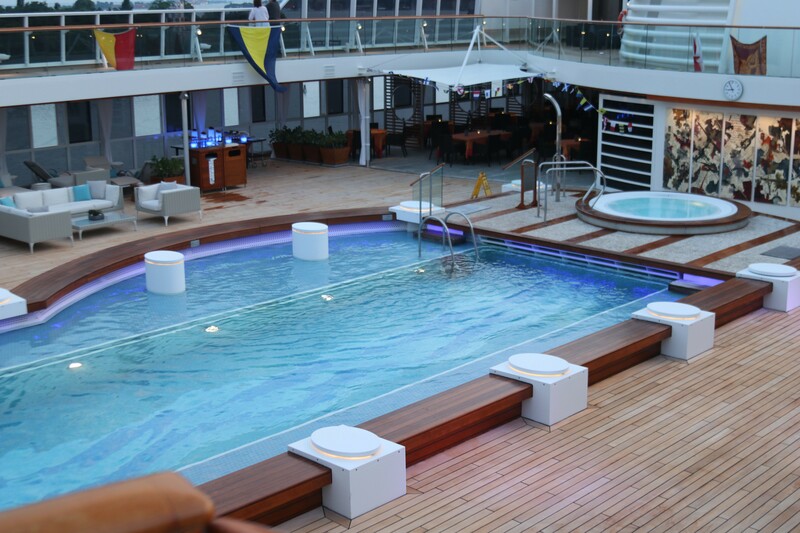 For now I will show you some aspects of the ship itself that had me never wanting to leave. Our voyage started in Venice, sailed down the Croatian coast, around the boot of Italy and ended in Sicily. 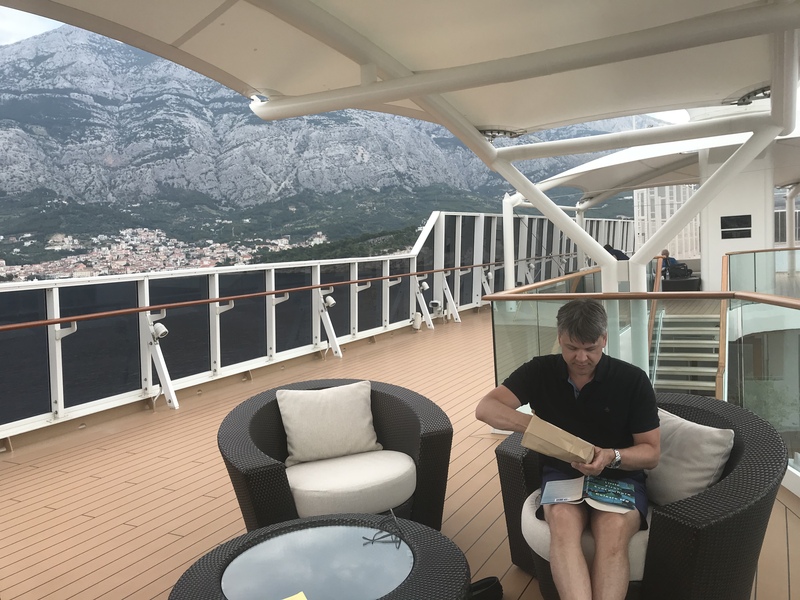 But after we disembarked in Siracusa, it kept sailing west through the Med, up around the bend to Amsterdam and then was headed up for several weeks cruising the coast of Norway and into the Norwegian archipelago of Svalbad…and then…well, you get the picture. In the Adriatic. 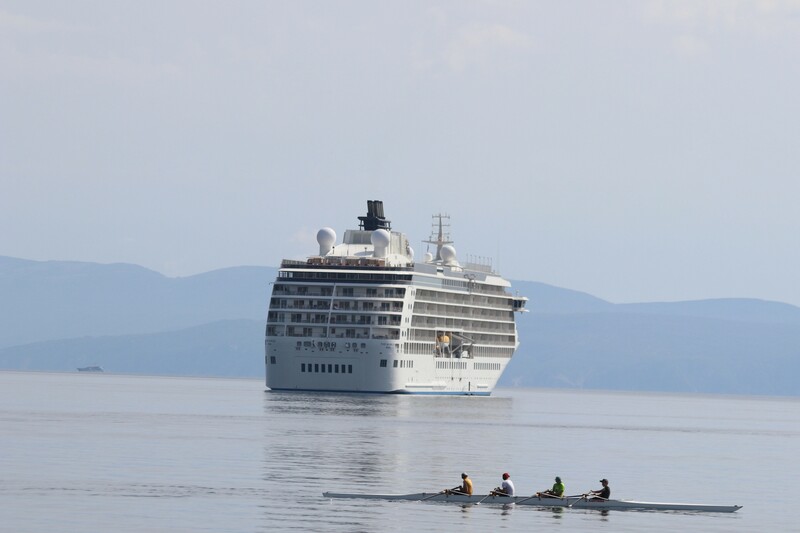 All of our ports of call in Croatia were reached by tender from where the ship was anchored off shore. 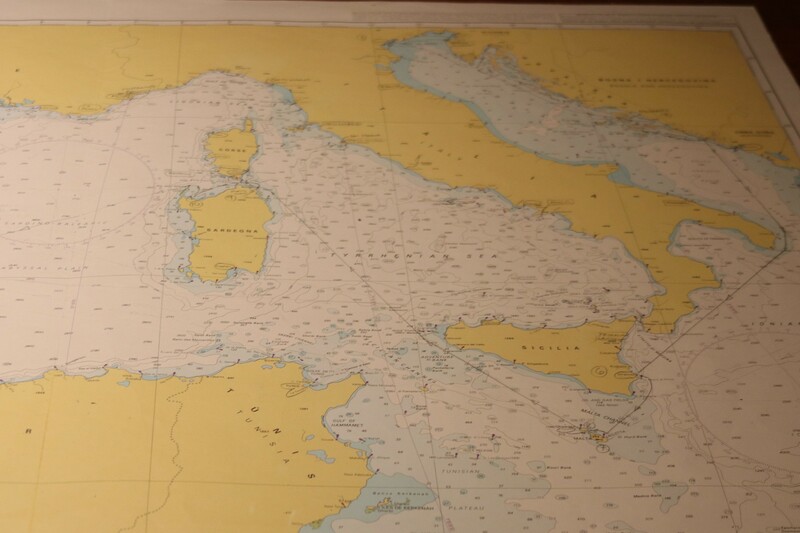 If you look closely you can see the line in pencil showing our route from Venice to Sicily. You can also see how after Sicily they headed to Malta and Sardinia among other places. 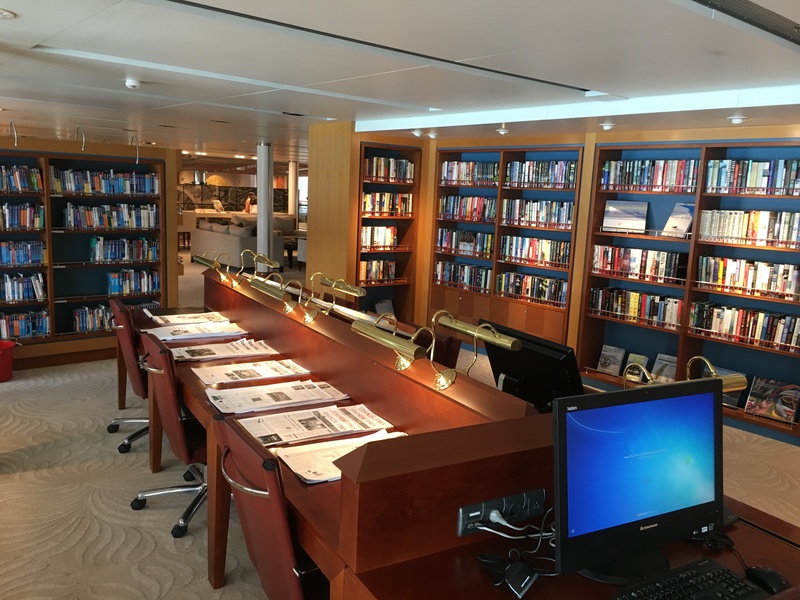 For someone spending a long time onboard, or who is satisfied to read just one big book at a time, The Study was chock-a-block with Everyman Library classics. Given the romantic, nostalgic, voyage around the world I mentioned earlier, I also romanticize the notion of plowing through all of these meaty classics on some months-long voyage. A general view of The Study. There are tons of DVDs one can check out in addition to many other TV options in the residence, but we never turned on the TV once. Well, only to look at the tender camera to see when it was arriving and departing. I wish this wasn’t blurry. 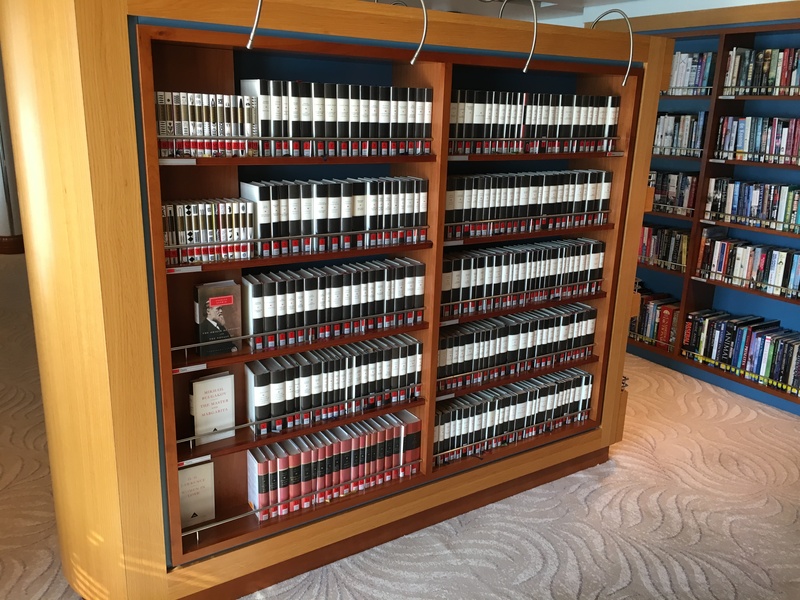 Obviously a ship going around the world needs lots of guide books. There were two more sections of guides on the opposite side of this case. 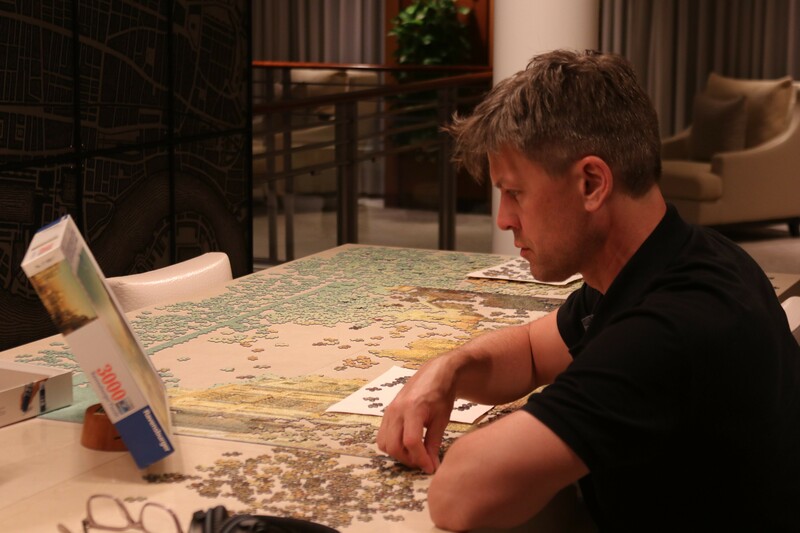 That’s me in the background…in the….wait for it…jigsaw puzzle area. 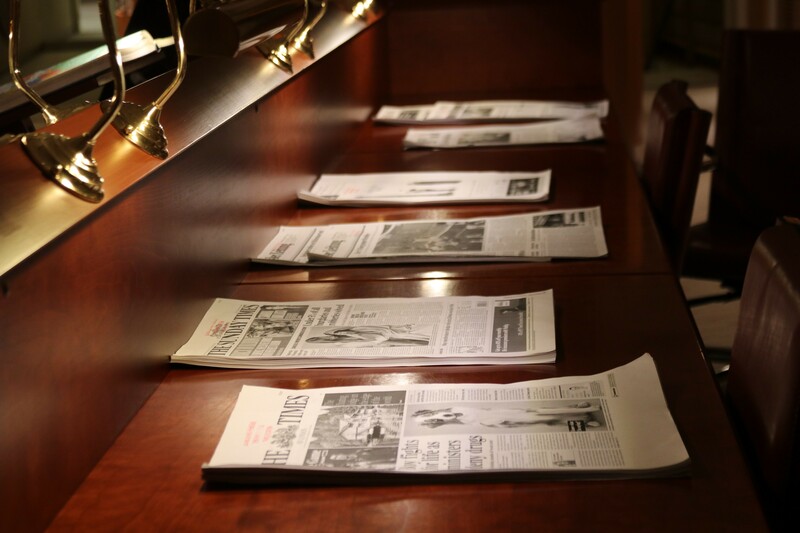 Print outs of various world newspapers. I think I looked at these only once during the trip. 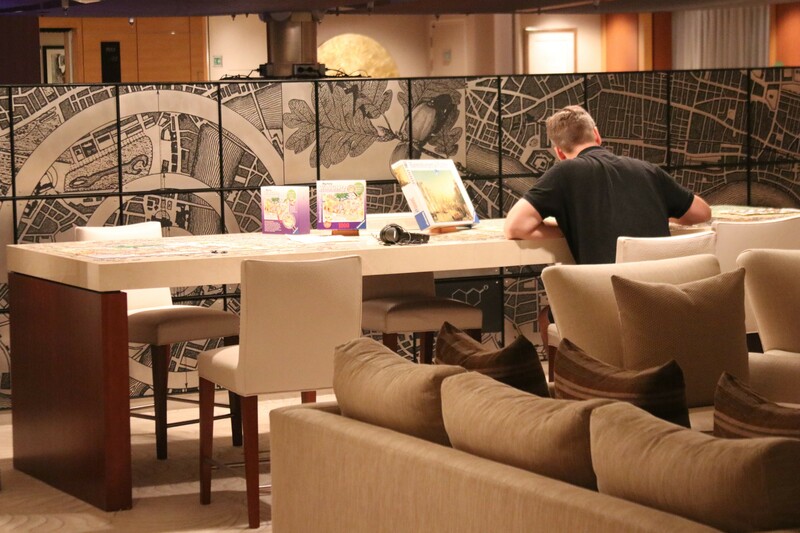 Most nights after dinner, either on shore or at sea, I ended up here working on one of two of the jigsaw puzzles. Note the height of the extremely spacious puzzling surface. It’s counter height so standing was a comfortable option and made moving around the 3,000-piece puzzle much easier. It is a good thing I didn’t experience this before our house remodel. One of the guest bedrooms may have been turned into a puzzle room. Also, most nights I had my headphones on and listened to fabulously loud classical music while I puzzled. Have any of you ever seen a puzzle cover stand?! Brilliant. 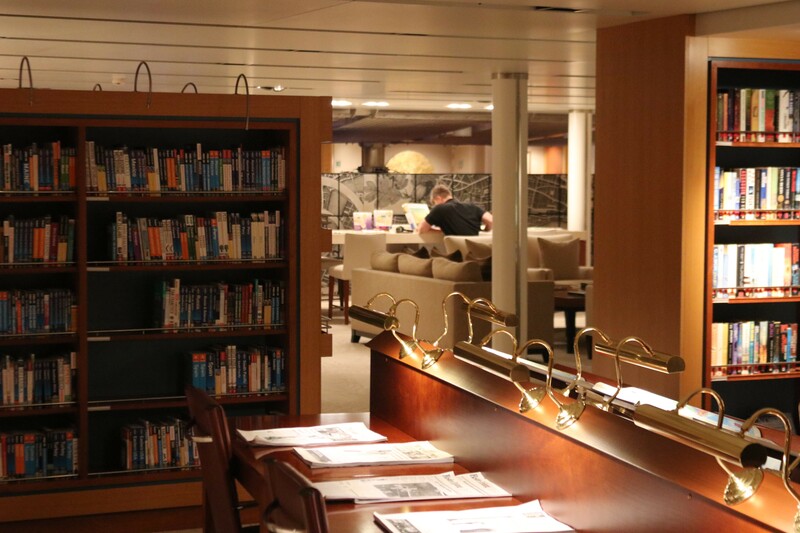 The Study and the puzzle area overlooked the lobby and were on the same deck as our cabin. Very handy. 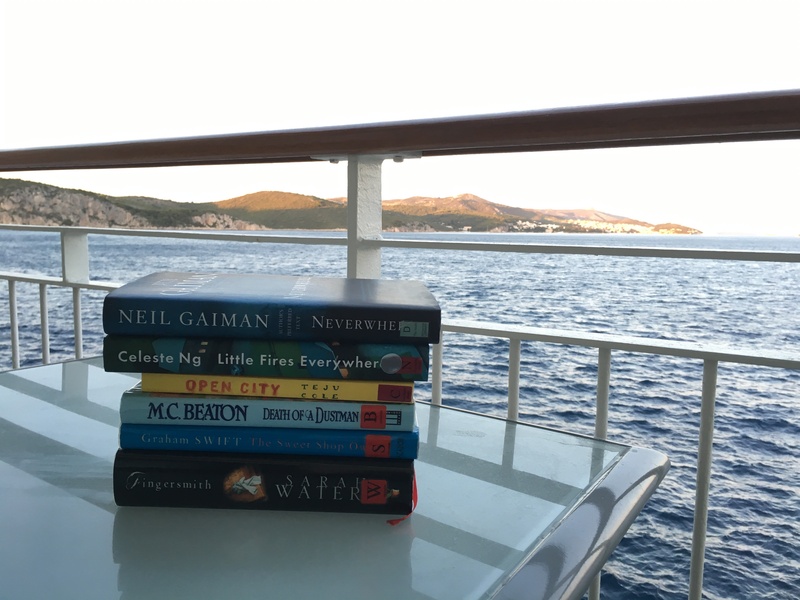 Even though I brought a ton of my own books on the trip, I couldn’t resist taking a few out of the library. Of this stack I actually read Open City (which I loved) and Little Fires Everywhere (which I didn’t). Interrupting the final pages of my book to eat a cookie with Makarska, Croatia in the background. Can you see why I didn’t want to leave? They also had a cocktail of the day. Did I mention that? Need to add more class to your workout? Perhaps you can convince your Gold’s Gym to add a neatly arranged sarcophagus of lemons. This was almost 9:00 at night as we sailed away from Venice, but often the pool was about this busy. Everyday after whatever adventure John and I came back for pool time with the cocktail of the day and a book. Lots more pictures of the trip to follow. Stay tuned. Wonderful! I love cruises, but this looks so special. I look forward to more photos. Looks like fun. I’m afraid of cruising bc I get so seasick just looking at moving water. Love the library and cocktail of the day . How wonderful! We’ve stayed in Makarska, eons ago, and really liked it. I love that ship! 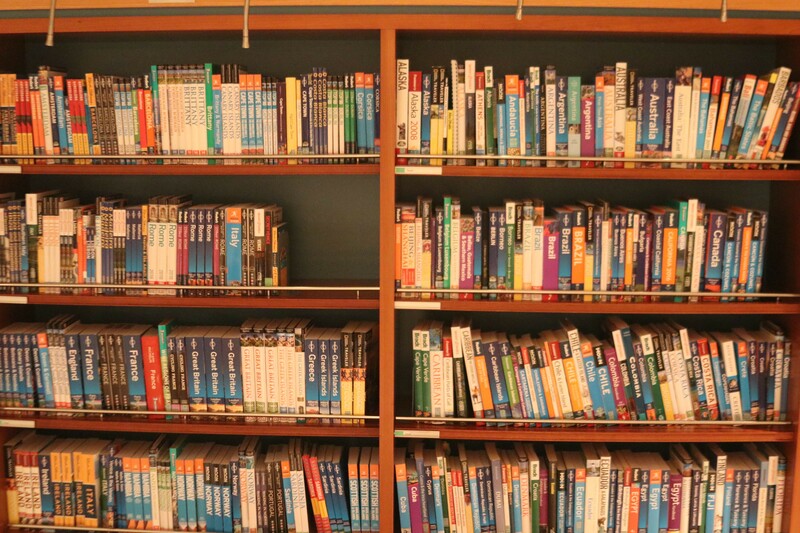 The library! I’m thrilled for you that you have the opportunity to sail on The World. I’ve been aware of and fascinated by this ship for many years. I remember watching a travel channel documentary about it which led me to visit their website and explore all the details of the ship and it’s amazing itineraries. I spent a lot of time imagining what an amazing life it would be to travel the world on The World! Alas, that sort of life is not within my reach, but it’s still fun to dream. Enjoy and thank you for sharing all these great photos. I never knew such ships existed. That sounds absolutely divine! I would have to get over a substantial fear of ocean travel to ever do it, though. I think I saw some Titanic documentary (probably PBS) at just the wrong young age when I was a kid, and subsequently, I have NEVER wanted to go on a cruise. I told my husband before we were married not to ever surprise me with one. :) But, a vacation where the travel is leisurely and “in between stops” there’s nothing to do but relax, that sounds like an awesome trip. So glad y’all got to enjoy it (and that you’re sharing the pics with us). Oh, that looks and sounds decadent, Thomas. I think I would have to figure out how I could stowaway in that library and puzzle room. I’ve never been on a cruise but the looks of this one could make me change my mind. This looks like an incredibly civilized way to travel. I’ve always been wary of cruises but this looks just my speed. Way cool! I’ve never heard of such a thing as this. Thanks for sharing. I had no idea this was a thing that existed. 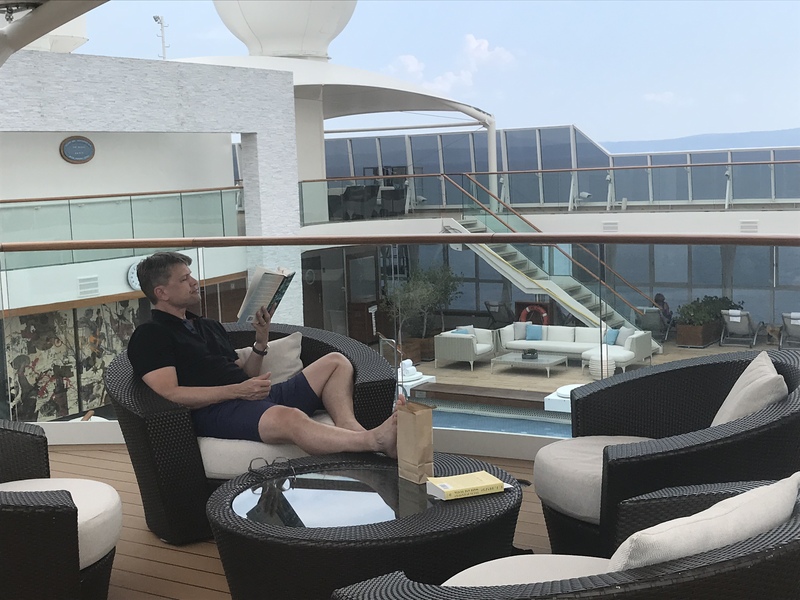 I just went on a cruise for the first time last year – it wasn’t something I thought I’d like, but now I can’t wait to go again. This post makes me want to buy a boat condo and just travel the world. Too bad my job doesn’t allow me to work remotely.